Building resilience to extreme weather needs a systems approach, including institutional ‘software’ as well as technical, financial, and physical infrastructure – or ‘hardware’. Designing, financing, achieving and evaluating success in the intangible aspects of resilience is challenging. Illustrating the systems approach to this challenge, the International Institute for Environment and Development (IIED) has been supporting the government of Kenya to invest in social software as a means to manage variable resource availability in the northern drylands. Between 1980 and 2012, it is estimated that the annual damage from extreme-weather related events rose from $20b to 150b, totalling close to US$2 trillion, of which only ¼ was insured. Examples include floods in Bangladesh and Thailand, typhoons in the Caribbean and droughts in the West African Sahel and Horn of Africa. Poor people and nations have been particularly vulnerable to the impacts of these events; people living in countries with a low Human Development Index make up only 11% of those exposed to hazards but account for 53% of disaster mortality. Building resilience to extreme weather needs a systems approach, which involves investing in a combination of technical, economic/financial, and institutional dimensions. When faced with a threat such as drought or flooding, the first instinct is to invest in hardware – such as dams to capture and store water for dry periods, or sea-walls to protect from floodwater. And such tangible infrastructure is clearly very important. But alongside such investment in the physical hardware of protection, there are a range of vital intangible investments needed in the software of institutions for managing variable resources, and sharing risk. Institutions may be invisible, but their strength can make a big difference in how societies cope with disaster. Building resilience also requires shared action and responsibility at local, national and international levels, by the public and private sectors, local communities and non-governmental organisations. We will use the case of northern Kenya to illustrate this systems approach, and the role that different actors need to play. Evolution of total herd size and the number of adult females under two scenarios of climate variability: (1) a drought every five years, and (2) a drought every three years. With funding from the UK’s Department for International Development (DFID), IIED has been supporting the government of Kenya to build resilience in the northern drylands. Over the last 15-20 years, this large drought prone region has suffered more intense and frequent drought events. Climate predictions for Kenya anticipate increasing frequency and severity of droughts and floods.7 The extended drought of 2008-11 caused livestock losses estimated at around 40-60% in some parts of Isiolo County. With an expectation of five years or less between drought events, there is not enough time for herds to recover from losses of such magnitude. This has a devastating impact on people’s livelihoods, since 80% of the population are dependent on livestock. The new Constitution of Kenya affirms a strong decentralised approach, better to address the priorities of local people through putting decision-making into their hands. Equally, the government has recognised the long-standing marginalisation of pastoral livestock keepers in this large northern region, and the need for a revised approach which understands the rationale for herd mobility. Keeping animals mobile makes the best use of seasonally variable grazing and water resources, as well as helping people manage with unexpected rainfall and pasture change. This means having collective management of large areas of grazing, and the ability of different groups to move herds between areas. Key elements to support this mobility include recognised ownership and management rights, co-ordinated by community groups, and flexible access arrangements. Working with traditional institutions to invest in water points is frequently the key-stone to better management of surrounding grazing. Amongst the Boran people of Northern Kenya, the Dedha is a customary neighbourhood institution for management of natural resources. Local Dedha councils identify which grazing areas need to be set aside for drought reserves – in these areas no one should graze their animals except during drought periods. The Dedha decide when these rules should apply and ensure such decisions are respected by herders. Young men are trained to patrol pasture and water areas to make sure people adhere to the rules. Since 2011, IIED has been working to help establish the Isiolo County Adaptation Fund, as a pilot to be managed at the county level, ensuring funds are prioritised by vulnerable communities to build their own resilience. The fund has supported a range of investments, which include rehabilitating sand dams, digging new boreholes, fencing of critical areas and setting up a radio station.16 In particular, the fund has supported activities to strengthen the Dedha. By designating and directing herds to areas of seasonal grazing during the wet season, these customary bodies conserve high value grazing and water for use over the dry season. By the middle of 2014, drought conditions had worsened across the north of Kenya and the National Drought Management Authority (NDMA) was reporting a rapid decline in climatic, vegetation and socio-economic indicators across Marsabit, Wajir and Garissa counties. But in Isiolo alone, animal health, child nutrition, and livelihoods seemed to have been less affected by the worsening drought. It can be difficult to estimate the impacts of such efforts to strengthen the Dedha vis-à-vis what might have happened had these interventions not been undertaken. Working with the Dedha in an effort to conduct such an analysis, IIED carried out a participatory assessment to estimate the benefits gained from better management of dry season grazing and drought preparedness, in terms of livestock survival rates, milk production, and reduced disease incidence. 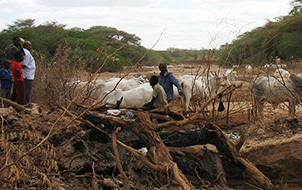 Shortly after this assessment with the Dedha was carried out, rains arrived in most parts of the county and fortunately a full-blown drought emergency did not develop.Nevertheless, the Dedha members argued that by October 2014, livestock mortality rates would have been as high as in previous drought years, if they had not set aside drought reserve areas. Although milk production usually stops in the long dry season and animals get sick more often, in 2014 these impacts did not occur. An estimate was made of the value of milk produced at this time and expenditures on medicines avoided, which were added to the estimated annual income to the Dedha from livestock sales. This partial identification of benefits from adaptation could then be compared with the costs of investment, both through the Isiolo County Adaptation Fund, and the contributions made by local people. Because the NDMA datasets showed that the vegetation conditions during 2014 were not in fact as bad as they had been during the 2011 drought, this introduced doubt concerning the levels of avoided livestock mortality estimated by the Dedha. Since it was not possible to verify what level of livestock mortality would have occurred during 2014 without theDedha’s interventions, the value of all avoided mortalities that the Dedha members had identified was removed from the calculation of benefits achieved during 2014. Even on this basis, Dedha members had still secured a remarkable return on their investment of at least 24:1. But had the rains not arrived when they did, and a serious drought occurred, the value of the avoided mortalities would be included in the return on the investment. This would then have yielded returns almost as high as 90:1. In addition to the local herds, livestock and people from neighbouring counties migrated into Isiolo. This helped them reduce their livestock losses and maintain milk production, and household nutrition – key benefits of particular value to women. The value of these additional benefits from the Dedha’s natural resource stewardship to the communities that they hosted from areas outside the county was even greater than the value of benefits received by Dedha members themselves. The market value of dry season milk produced by the animals belonging to the displaced pastoralists was 342 times the Isiolo CAF investment in strengthening the Dedha and 50 times the cost of the entire DFID program (£455,687, including all of its start-up, overhead costs, and all funds spent on all types adaptation projects, not just the institutional strengthening of the Dedha). A broad range of other beneficial effects on the economy and society were noted but could not easily be valued. These included the reduced need to migrate long distances for water and pasture, resulting in reduced security risks and increased time spent at home with family and time spent taking care of local business. Strengthened local institutions enhanced the voice of local leaders and created employment for young men who played a key role in resource surveillance, as well as reducing dependence on food handouts and social assistance. If these benefits could also be quantified, they would demonstrate the very significant return on investment in natural resource management to both local families, and the public finances of Isiolo and the surrounding counties. In the coming years societies around the globe will need to find ways to build greater resilience to extreme climate events in this warming world. Investment in physical infrastructure, the hardware of disaster resilience, needs to be matched by strengthening of intangible but powerful institutions that help people manage risks and achieve collective agreement on how resources are best used. The example of the Dedha in northern Kenya shows the considerable returns gained from investing in social software, by re-establishing customary management systems, as a means to manage variable resource availability. While much of the work and investment is made locally, its ability to operate effectively relies on the national level framework to decentralise power and decision-making to county level. Equally, the funds from international donor agencies, such as the UK’s DFID, have helped make this pilot possible, from which it is hoped that many other such initiatives can learn. Camilla Toulmin is Director of the International Institute for Environment and Development (IIED). Daoud Tari is a Visiting Fellow at IIED and leads the Resource Advocacy Programme (RAP), a community trust based in Isiolo County, Kenya. Caroline King-Okumu is a Senior Researcher working for IIED’s Climate Change Group. The work described in this article has been undertaken by IIED in collaboration with many colleagues from Kenya, especially Ibrahim Jarso, Hildah Kathare, Lordman Lekalkuli, Luigi Luminari, Nelson Mutanda, Nour Godana, Mumina Bonaya, Cynthia Awor, Jane Kiiru, Victor Orindi, and IIED colleagues Morgan Williams, and Kate Green. This blog first appeared on ANGLE. View original for full references. Previous Previous post: A New York take on Sustainable Development: Is it feasible?